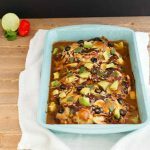 This super simple slow cooker garlic chipotle lime chicken is a very flavorful, paleo, low carb dish that can be tossed in the slow cooker in a snap. A set it and forget it crockpot dinner with Instant Pot directions. 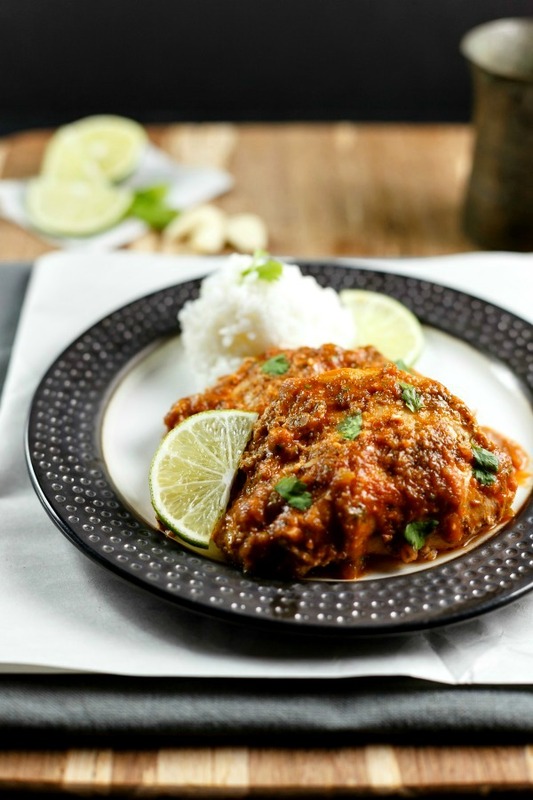 Slow Cooker Garlic Chipotle Lime Chicken is a super easy to make, low carb and paleo dish. Basically, you whip up the sauce and throw it over the chicken in the crockpot or Instant Pot, then set it and forget it until dinner. This can be made milder to a little spicy depending on how much ground chipotle powder you use. I made mine mild as my poor hubby can’t handle spicy food, but if I had my way I would crank up the spices all the way up. Serve with some cauliflower rice for a favorite low carb meal! This can also be easily made in the Instant Pot as well and I’ve added Instant Pot directions below. In a food processor or blender, add all the sauce ingredients and pulse until smooth. In a slow cooker on high or low heat add chicken breasts or thighs. Pour the sauce over the top of chicken. 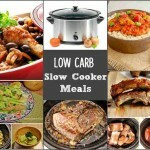 Close slow cooker lid and cook for 4 to 6 hours on high or 6 to 8 hours on low. Serve & enjoy. In a blender or food processor add tomato sauce, chicken broth, olive oil, garlic cloves, green chiles, apple cider vinegar, lime juice, cilantro, erythritol sweetener, chipotle powder, cumin, sea salt, and black pepper. Pulse until blended. Set aside. Spray the bottom of the inner pot of the Instant pot lightly with non-stick coconut oil spray. Add chicken thighs to the pot. Pour the sauce over the chicken. Close, lock the lid and flip the steam release handle to the Venting position. Select Slow Cook on “More” setting and set the cook timer for 4 hours. When the cook time is complete, open the lid and transfer the chicken to a serving platter. Select Sauté (Normal) and let the sauce simmer in the pot until thickened, about 6-8 minutes. Pour over chicken & serve. 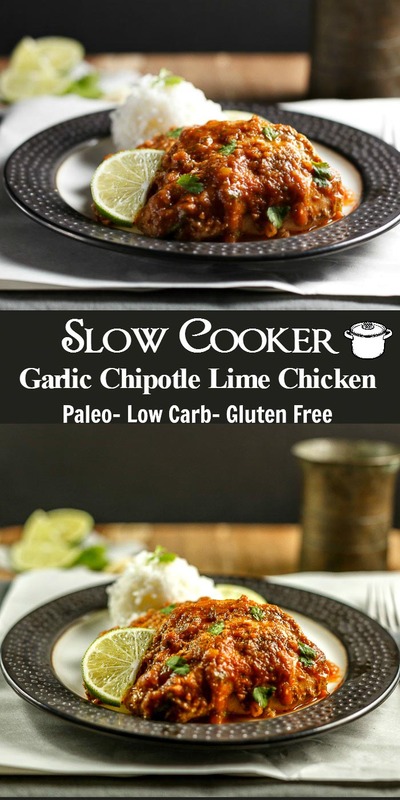 Nutritional Data for Low Carb Version: Yield: 6 servings, Amount Per Serving- Cal: 183, Carbs: 2 g, Net Carbs: 2 g, Fiber: 0 g, Fat: 9 g, Protein: 22 g, Sugars: 1 g.
This super simple slow cooker garlic chipotle lime chicken is a very flavorful, paleo, low carb dish that can be tossed in the slow cooker in a snap. A set it and forget it crock pot & Instant Pot dinner. This recipe looks amazing, and I give bonus points for being able to use my crock pot. I do have a question, though. How does 1 1/2 pounds of chicken make 6 servings? That would be a 4 ounce portion. 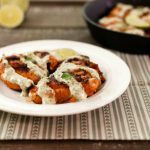 It is 6 if you’re using boneless skinless chicken thighs, but probably only 4 -5 servings if you’re using the larger boneless skinless breast halves. Still looking for IP recipe that was mentioned back in September. Melo, IP directions are now included. Sorry, it had some small adjustments I needed to rework for IP. I doubled recipe but my end result looked NOTHING like your picture. Mine ended up very liquidity and not the rich color that yours was… what did I do wrong?!!! Think I may try it in the oven bc crockpot creates more water. I think doubling the recipe would make more liquid. You may need to not quite double the liquid ingredients. Recipe looks INCREDIBLE! If you were to use an oven instead, how long would you bake for, and at what temp? I know you have only done in it a crock pot, I am just considering trying the oven method for days I’m starting dinner right after shopping. Hi Kay, I think you could bake it at 400F for around 30 to 35 minutes. I just ate a thigh from the pot and it is delicious. Boxed the rest of the meat up for lunches and covered with sauce. The rest of the sauce got lovingly bottled, to be used on other meats next week. Man is it good! Hi Jane, thank you so much for trying the recipe and sharing your additions. I particularly like the jalapeño pepper addition, but my hubby would think I’m trying to burn him with my spicy foods. I’m like”what, jalapeños are not even that spicy, I could have used habaneros!” Yes, pork would be amazing with the sauce! !BTW, it sounds like you are an excellent cook. That was delicious and super flavorful! I seared the chicken thighs (bone in/skin on) before I put them in the crockpot because I like the skin that way. They were fall off the bone tender after four hours. I recommend bumping up the spice if you like spicy foods because this was not spicy. I still absolutely loved it and already convinced my dad to make it for himself this weekend. Five stars for sure!! The sauce is incredible and I think this would be great with a pork shoulder, too. Will definitely make again and again! Thanks for the recipe! Has anyone made this in the Instant Pot? I haven’t yet, but an Instant pot is on my wishlist. Can you please clarify if tomato sauce is ketchup or just tomato purée/ sauce from a can? Hi Jacqui, It is tomato puree from a can or carton, not ketchup. This recipe sounds wonderful, but is the sweetener necessary? Is it too sour or tart without it? I just don’t add sweeteners to anything. Lynne, The sweetener is not necessary,it is optional and just enhances the flavors, but is not a deal breaker to leave it out. I love chipotle! This recipe is right up my alley. 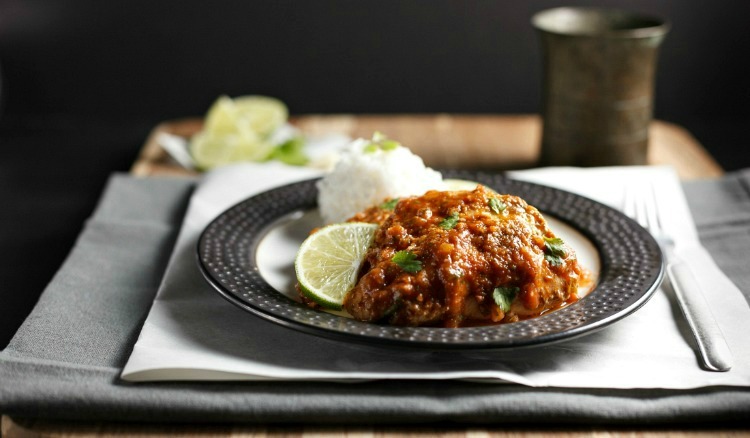 This chicken recipe looks to be extremely hearty, healthy, and delicious. Also, it’s a slow cooker recipe so it’s truly the perfect recipe for all circumstances. Nom! I need more recipes to use up my chipotle powder, this looks like a good one. Yum! This sounds lovely and I am always on the hunt for new slow cooker recipes to add to my rotation! 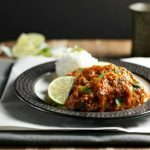 This looks like something you’d get in a nice restaurant, yet I love how you make it a slow cooker recipe! I love any meal that you can just mix a few things and throw it in a crock pot. Stacey – This looks AMAZING! I’m like you and like my spices on full blast. Also, you know how much I love slow-cooker meals that are easy, quick and delicious. I’m adding this to my list right now. Yum! This sounds incredible, and I’m always looking for easy crockpot recipes to satisfy my Mexican and Tex Mex cravings! This sounds delicious! I love lime so much, and it sounds delicious paired with all of that garlic and chipotle! This sounds delicious and I bet I can make it in my Instant Pot. It sounds like it has so much flavor-yum! Thank you Jessica, I think slower cooker and instant pots are similar, so it would work. I have been using my slow cooker so much this winter already. I’m excited to try this recipe. Thanks! Love slow cooker meals and this garlic chipotle lime chicken sounds amazing ! I’m mouthwatering here ! I just love that you made this with the crockpot! I am always looking for comforting recipes for my crockpot and this one fits the bill! Can not wait to make this, thank you! Thank you Halle, I love my crockpot too! My mouth is watering! I love smokey chipotle any day of the week! Those green chilies make it fantastic i bet! This recipe really appeals to me. I don’t use my crockpot enough, but will break it out to try this one. Thanks for the great recipe. Thank you Kim. I use mine all the time. I’m thinking about getting an Instant pot next. Set it and forget it dinners are the best! Love the flavors in your dish! Oh I love these ingredients! Yummmm! This dish sounds so incredibly flavourful I want to make it straight away. Love the combination of chili and lime.